Just making your way through a fluid dynamics test could define you as a mechanical engineering student. Though such Purdue students come with a variety of identifying characteristics. They pursue research in diverse fields from the traditional (motors, gears, and such) to the near fantastical (mechanical animals, space travel, and so forth). But among them also are the actors, craftsmen, and musicians who bring art into the world — in addition to their engineering ambitions. To follow: an actress, a jewelry maker, and a couple of drummers from Purdue’s “All-American” Marching Band. All of them are mechanical engineering students connecting the arts with engineering. 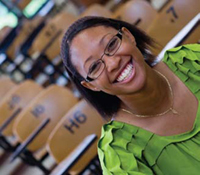 Student Actress: Ashley McElroy in the classroom and on stage. “When my family came to see it, they said I was playing myself,” says McElroy with a laugh, referring to the academic drive, strong opinions, and the sometimes changing mind she shares with the character she played. Since grade school, music captured much of McElroy’s attention. Growing up in Bloomington, Illinois, she played the cello in various symphonies, including the Chicago Youth Symphony. Oddly enough, two of her choices for college came down to West Lafayette and Bloomington, Indiana — to be a musical Hoosier or a Boilermaker engineer. The sheer practicality of engineering won out. Though a bit nerve-racking, acting could be in the cards again, as well. Soft-spoken by nature, McElroy says the thespian experience proved to be a confidence booster. “You really have to put yourself on the line when you’re out on stage,” she says. As mechanical engineering studies lead her toward a possible career in energy and sustainability, McElroy knows the same dedication and passion to the arts can lead her through the classroom challenges. And when it comes to presenting a senior design project, her performing skills once again may take center stage. As someone who sculpted in bronze castings throughout his high school days back in Oregon, Matt Prowant (BSME ’10) was looking for a new artistic outlet to supplement his mechanical engineering studies. “I wanted to learn a similar, but new, trade,” he says. Handyman: Matt Prowant at work in a design lab of Pao Hall of Visual and Performing Arts. 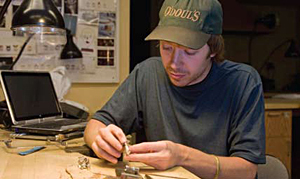 His solution: three years of classes in jewelry making in the metal studios of Yue-Kong Pao Hall. There, he spent much of his free time applying a torch to creations that would become a collection of various rings, necklaces, and mechanical bracelets. But the artist to engineer leap (and the balance of the two) wasn’t as difficult as one might suspect. “The two disciplines actually tie together a decent amount,” says Prowant, who began a job at the Department of Energy in June. “I was able to help some of the other students design certain clasps and latches. I also used engineering and problem-solving methods to design jewelry.” One such problem-solver came when it was time to present initial ideas for pieces to one of his teachers. When she was unable to visualize his intentions for a particular design, Prowant used AutoCad to show a design in three dimensions that could not be easily explained, or even represented in a simple sketch. With his new nine-to-five routine, Prowant focuses on ultrasonic emissions for the Department of Energy in Richland, Washington. He’s specifically analyzing and improving current technology used for measuring weld-line cracks for better and safer operation of reactor water pipes. But he has no plans to leave the kiln and his artistic ambitions behind him. For Prowant, who also plans on revisiting bronze sculptures in an old friend’s barn back in Oregon, the hands-on stress reliever with direct ties to the mechanical arts will always complement his engineering mind. Back in the day, Purdue students had to choose between ROTC and the marching band. The fife-or-rifle option ensured an extracurricular activity that would add to already busy schedules. These days, many engineering students just attend to the task at hand — the challenging coursework. 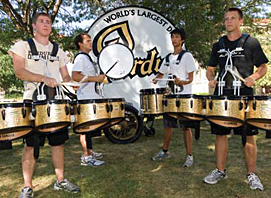 A surprising number of engineering students, however, balance their studies with roles in Purdue’s “All-American” Marching Band. And this fall, eight mechanical engineering students took to the football field on the drum line. ME Drummers: Mechanical engineering students (left to right) Brian Leathers, Blaine Kubit, Kevin Tsai, and Adam Pierce help keep the beat as part of Purdues All-American Marching Band. Like the engine composed of many moving parts working together, all four sections of the drum line (snare drums, tenor drums, bass drums, and cymbals) have to coordinate precisely to produce the best sound and cleanest rhythms, Leathers says. Even Tsai’s interest in sound engineering and acoustics echoes with his drumming passion. And while engineering may pay the bills, music will remain more than a hobby throughout his life. He played in a touring, professional drum corps last summer and says he learns more about music anytime he teaches someone else. As far as timing when it comes to balancing marching band demands with mechanical engineering studies, both these drummers will tell you they are more focused when busy. “It forces you to manage your time better, which is helpful later on,” says Leathers, who hopes to keep his percussion outlets open with his professional sights set on turbine or airplane engines.